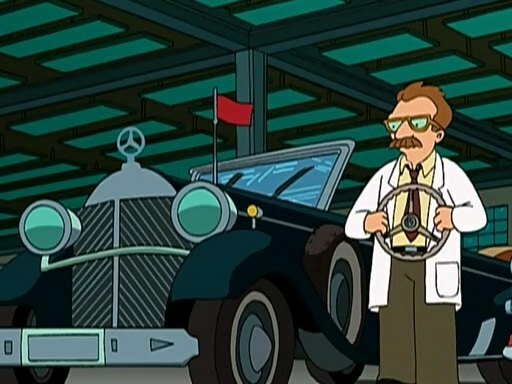 IMCDb.org: 1930 Mercedes-Benz 770 [W07] in "Futurama, 1999-2013"
Artist’s rendering of Adolf Hitler’s Mercedes??? That's the idea (apparantly the "werecar" in this episode is the most evil car ever created, using such evil parts as the steering wheel from Hitler's Mercedes, the turn signals from Ted Bundy's Volkswagen, the windshield wipers from KITT, and Ed Begley Jr's electric powerplant). But of course, Bundy drove a Beetle, not Microbus. Charles Manson. Ted Bundy drove a Beetle.